• Propane is an affordable, clean, American-made fuel that is a gas normally compressed and stored as a liquid. It is most commonly used for space and water heating, for cooking, and as a fuel for engines; however, its applications are rapidly growing due to new technology developments. • Propane is nontoxic, colorless, and virtually odorless; an identifying odor is added so it can be detected. • Propane is also sometimes known as liquefied petroleum gas, or LPG. When used as vehicle fuel propane is known as propane autogas. 2. Where does propane come from? • Propane is primarily a byproduct of domestic natural gas processing, though some propane is produced from crude oil refinement. U.S. propane supplies are becoming increasingly abundant due in large part to increased supplies of natural gas. • As shale gas extraction has increased, the production of propane from crude oil refinement has dropped dramatically. In 2011, 69 percent of the total U.S. supply of propane came from natural gas liquids produced in the U.S. and Canada. • Much growth in propane supply is expected to come from the Marcellus shale play in the northeastern U.S. Industry observers estimate the Marcellus shale alone can supply more than 2 billion gallons of propane per year. • Because of the drastic increase in U.S. sources of propane, the U.S. produces more than enough propane to meet current demand and became a net exporter of propane in 2011. • Affordable. Propane prices have fallen relative to gasoline, diesel fuel, and home heating oil due to the growing supply. • Cleaner. Propane is a cleaner-burning, lower-carbon fuel than other petroleum-based products such as gasoline or diesel because it burns hotter and more efficiently. • Abundant and Domestic. In 2011, domestic propane production from natural gas plant liquids exceeded consumer demand for the first time. Propane is an abundant bridge fuel, making it a clean-burning alternative to gasoline and diesel that can address energy challenges while long-term renewable technologies are developed. • Propane is used in 48 million households as well as many businesses for water and space heating, indoor and outdoor cooking, clothes drying, and backup power. Additionally, many industries increasingly choose propane to cost effectively fuel vehicles and equipment while lowering emissions. • On-Road Vehicles. Propane autogas is an approved clean alternative fuel under the Clean Air Act of 1990 and the third most popular vehicle fuel worldwide behind gasoline and diesel. Propane is commonly used to fuel buses, light- and medium-duty trucks, vans, shuttles, taxicabs, and police and government vehicles. • Professional Landscape Equipment. More than 15 models of propane-powered commercial lawn mowers are available today from industry-leading brands. • Agricultural. Propane is used on more than 660,000 farms for irrigation pumps, grain dryers, stand-by generators and other farm equipment. It is an essential fuel for crop drying. 5. How is propane distributed? • With up to 56,000 miles of pipeline and nearly 6,000 retail dealer locations nationwide, propane is widely available and easily portable. • For on-road use, there are more fueling stations in the U.S. for propane autogas vehicles than there are for vehicles of any other alternative fuel except electricity. Propane is the only alternative fuel with fueling stations in every state. 6. How does the propane industry contribute to the economy? • The propane industry generated nearly $15 billion in direct domestic value in 2009. Nearly 50,000 workers across the U.S. are employed in propane production, transportation, and distribution. 7. What is the cost of propane? • We are always below competitor prices due to low overhead costs. • We pass our savings on to our customers. • Call for current prices. 8. How do I pay for the propane? • You can pay by credit card, check, or cash. 9. When can the propane be delivered? • Call the office for the delivery schedules. • There are delivery routes established that you can count on, but we will always make every effort to be flexible to meet your needs. 10. Do I need to be home when the propane is delivered? • No, you do not need to be home for delivery. Call the office to make payment arrangements. • A receipt will always be left for you showing how many gallons of propane were delivered. 11. Will you fill a tank that I rent from another company? • Unfortunately, there is a law that prohibits us from putting our propane in another Company's tank. We can only fill your customer-owned tank or our company owned tank. 12. What do I do if I want to own my own tank? • Call the office and we will help you determine the size of tank you need to provide for your propane needs. • We will discuss with you the options available to help you purchase your own tank and start saving money on propane fills. 13. What appliances can run on propane? • Space Heating: Furnaces, boilers, garage heating, zone heating, and hybrid heating systems. • Water Heaters: Storage tank and tankless water heaters. • Kitchen Appliances: Propane gas ovens, ranges, and indoor grills. 14. Do I need a gas detector in my house? PERC recommends that homeowners consider installing one or more UL-listed propane gas detectors and carbon monoxide detectors. This is important if you or others in your home have difficulty smelling propane, or if appliances are in little-used areas of your home where the smell of propane might not be detected. Detectors can provide an additional measure of security. And remember to always follow the manufacturer instructions for installation, location and maintenance of your carbon monoxide or propane gas detectors. • We will get your information and set a delivery date with you. • We are available day or night, 7 days a week (Holidays even!) for any questions, or concerns. 16. What should I do if I run out of propane? Running out of gas can create serious safety hazards. If your propane tank runs out of gas, any pilot lights on your appliances will go out. This can be dangerous if not handled properly. 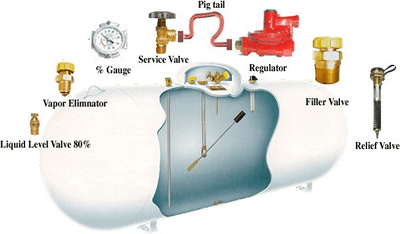 A propane retailer or a qualified service technician must perform a leak check of your propane system before turning the gas back on. 17. How often should I check my propane tank supply? Making sure there is an adequate supply for propane in your tank at all times is an important safety step for you and your family. Establish a regular delivery schedule with your propane provider to prevent running your tank empty. Also, periodically check the fuel gauge on your propane tank. If the fuel level drops below 20 percent, call us to schedule a delivery. If you don't have a gauge on your tank, contact us. 18. How early should I contact Wolf Propane to discuss my propane needs for winter? • The summer is a great time to contact us to discuss pre-buy and programs.